The first thing you need to understand is that the cats have won. You’re not quite sure how it happened — the joke was always that the cockroaches would win, right? — but it turns out that cats very much enjoy killing cockroaches, and so here we are. Your job is to feed the cats and, though you’d never say it aloud even in whispers, present offerings to the cats. They’re gifts, really; or at least you think that’s what they’re called. All the post-apocalyptic movies and television shows you used to watch presented a future in which English would be the dominant language. That was one of many things they got wrong. And yet your life is not so much different, after all. 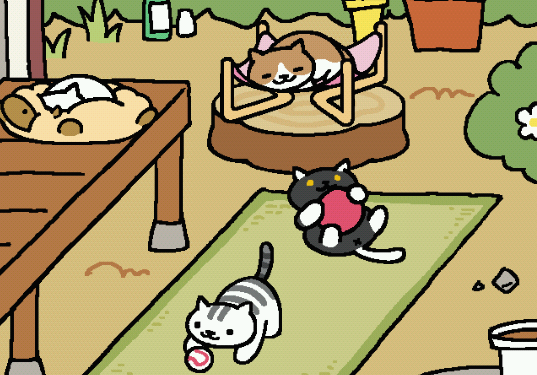 You wake up in the morning, put out cat food, painstakingly arrange the cat toys, and wait. When the cats come, they leave you a pile of dead things in exchange, as cats do. You, in turn, walk your basket of stinking fish to the market to buy more cat food and a cardboard box shaped like a car. No one drives cars anymore. You do not ask what happens to the fish you exchange for these cat toys, just like you do not ask what meat is in the thin soup they hand you, in its little cardboard bowl. That is what you eat. The cats eat food you recognize, except now someone has taped a piece of red cardboard with a cat pawprint to the can, as if to indicate that all food is for the cats now. You put out fresh sashimi, sometimes, arranged as best as you know how. The cats come, play, leave their dead fish. Another day ends. You do not put out billiard balls for the cats, although you put out every other kind of ball; yarn, ping pong, baseball, huge rubber balls in all colors. One day you see a cat wander through your yard wearing a baseball cap. Another day you see what appears to be a cat in a wig and cocktail dress. You wonder whether the cats are evolving or you’re starting to hallucinate. You have a bottle of sake that you keep in the yard, because the cats will no longer allow you to sleep in the house. The cats do not drink the sake. They do not need it; they have everything else. But on the days when your mind is clearheaded you think about how it is still not that different; how you used to get up and go to a job and spend your money on things that served the job — the smartphone, the clothes, the takeout — and now you get up and serve the cats and spend what they give you on more goods to serve the cats. The difference is that you felt a little like the smartphone and the clothes and the takeout benefited you as well. You knew you wouldn’t wear those shoes if you didn’t have that job, but you also liked the way they looked on you, so it seemed a bit more fair. But you are too big to sleep on the cushions or climb into the cardboard car, and the only thing that benefits you now is that you get to look at cats. It is always relaxing to look at cats. Unless that’s coming from the sake, or the rotted fish soup, or the antihistamines. There are rumors that if the cats approve of your performance they will bring you actual treasures, although when the first treasure comes it is a shell earring, and you put it on and wonder whether this is a true gift or a symbol of your obedience. You would love to accumulate enough treasures to leave the cats behind, although you do not know where you would go or how you would get there. One person decided to strike out alone, stacking cans of food inside the cardboard car and tying the package closed with yarn. The cats brought his body back, as cats do.